Many of you send emails asking if we’re working on PictraMap and if you will ever live to see the day when we finally start blogging. I’ve been postponing the start of this blog for a very long time … I recognize the pattern from my freelance practice – even though I have a number of years’ experience, I still get anxious sometimes when I land a new project or start working with a new client. Will I do a good job? Will the client like my ideas? What about execution? The same thing happened with PictraMap’s blog. I got anxious if you’d like it. There are so many travel bloggers out there and I don’t fancy myself as a professional blogger, neither as a professional traveler or a travel writer. So why would anyone want to read what I have to say? My partner, Jordan, and I are passionate travelers and freelancers. We spend most of our hard-earned money on airfares, accommodation, rent-a-car deals, walking tours, boat trips and food all around the world. We are what people call “digital nomads” and we love meeting like-minded people with whom to exchange knowledge and ideas. We strongly believe that traveling is the only thing you spend money on that makes you richer and through blogging, we want to inspire the same belief in you. We want to help you define your dream life and turn it into reality. Furthermore, we’d love you to inspire others to do the same. So today I decided to face down my fear and just start blogging. Here’s what you’ll find on PictraMap’s blog going forward. We like planning our own trips so a big part of this blog would be advice on things to do in different cities or countries, where to stay, where to eat, how to make the most of your time when traveling, etc. We just returned from a world-wide trip and I am eager to tell you how different life and society is on different continents. So I will share this kind of impressions about countries, cities and cultures in this category of the blog. What’s a travel blog without traveling notes, eh? Sometimes I’ll share my travel experiences, other times Jordan will show you things from his perspective, and yet other times we might give you the floor as we love not only seeing your animated travel maps but also hearing your stories! And of course we’ll use this blog to make house announcements. When there’s a new feature release, a tip to better use the tool, or just a note what we’re up to – this is where we’ll let you know. 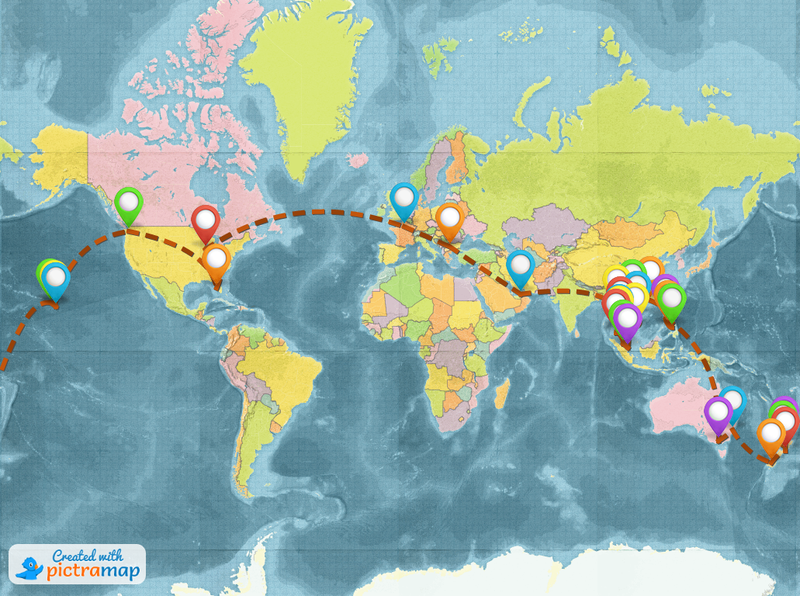 If you haven’t created an animated travel map with PictraMap yet, give it a try – it’s free and entirely online based. We’d love to hear your thoughts as it’s a tool we made entirely based on user feedback. We continue to add new features based on travelers’ requests, too. When you create an account, you will also start getting email updates but if you’re not ready to commit yet, that’s alright. To stay updated with the blog and everything else without creating an account, we invite you to join our community. Thanks for reading and keep in touch! Diana is a freelance marketing consultant by day, and a traveler by heart. According to her TripAdvisor Travel Map, she has covered 18% of the world, and counting. She loves exploring new countries and cultures like a local, and making new friends. Join here to stay in touch!